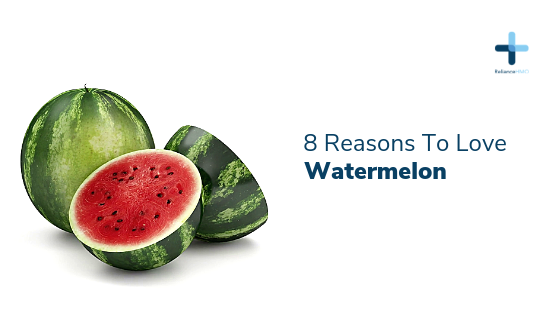 Watermelons are mostly water (about 92 percent) but this refreshing fruit is also soaked with nutrients. Each juicy bite has significant levels of vitamins A, B6 and C, lots of lycopene, antioxidants and amino acids. There’s even a modest amount of potassium. Body Hydration: The most important benefit of this red, juicy fruit is water, which is as high as 92%. It is no surprise that you feel hydrated as soon as you start biting into a slice of watermelon. Reduces body fat: Watermelons contain an amino acid called Citrulline which converts to arginine. This conversion blocks the creation of fat from fat cells, thereby reducing fat accumulation in the body. Digestion: The high fiber content in watermelon, supplemented by the high water content, aids in smooth digestion and clears constipation. Healthy Heart: Watermelon contains lycopene, which dilates the blood vessels and allows for smoother flow of blood. The lycopene is proven to protect against various heart ailments. Skin: The Vitamin A in watermelon aids in generation of hair and skin follicles, production of sebum, and moisturizing the hair follicles. This also promotes better condition of supporting tissues like hair, teeth, soft tissues and mucous membranes. Needless to say, the high moisture content also adds to improved look of hair and skin. Cancer Prevention: Watermelon, especially a nicely ripened fruit, contains a lot of carotenoids, flavonoids, and triterpenoids. These are proven anti-cancer chemicals and reduce the formation of free radicals in the body which are responsible for cancer. Vision: The bright red colour of watermelon is from beta carotene and watermelon is also a rich source of it. Beta-carotene helps in the production of pigments in the eye. It can also prevent macular degeneration and night blindness.